This doc has been adapted from Mikhail Shilkov’s blog entry Monads explained in C# (again). It attempts to explain the rationale behind Monads, providing simple examples and how they relate to standard library constructs. If you’re just interested in the API, head down to the Monad typeclass page. I love functional programming for the simplicity that it brings. But at the same time, I realize that learning functional programming is a challenging process. FP comes with a baggage of unfamiliar vocabulary that can be daunting for somebody coming from an object-oriented language like Kotlin. 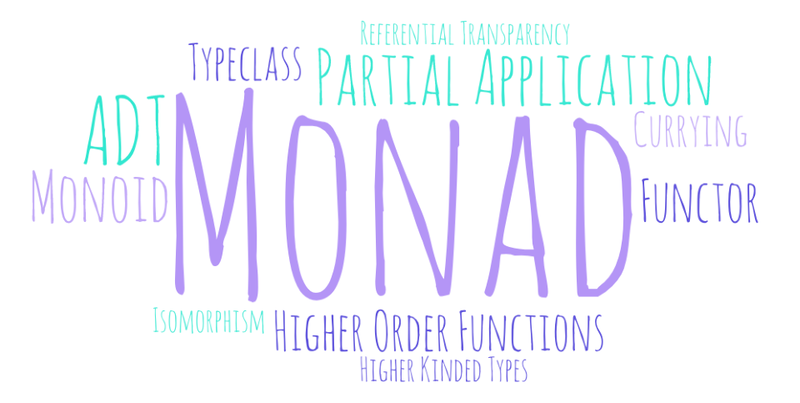 Monad is probably the most infamous term from the list above. Monads have reputation of being something very abstract and very confusing. Numerous attempts were made to explain monads in simple definitions; and monad tutorials have become a genre of its own. And yet, times and times again, they fail to enlighten the readers. It’s both mathematically correct and totally useless to anybody learning functional programming. To understand this statement, one has to know the terms “monoid”, “category” and “endofunctors” and be able to mentally compose them into something meaningful. The same problem is apparent in most monad tutorials. They assume some pre-existing knowledge in heads of their readers, and if that assumption fails, the tutorial doesn’t click. Focusing too much on mechanics of monads instead of explaining why they are important is another common problem. The problem here is likely the following. Every person who understands monads had their own path to this knowledge. It hasn’t come all at once, instead there was a series of steps, each giving an insight, until the last final step made the puzzle complete. But they don’t remember the whole path anymore. They go online and blog about that very last step as the key to understanding, joining the club of flawed explanations. There is an actual academic paper from Tomas Petricek that studies monad tutorials. I’ve read that paper and a dozen of monad tutorials online. And of course, now I came up with my own. I’m probably doomed to fail too, at least for some readers. The base element of each functional program is Function. In typed languages each function is just a mapping between the type of its input parameter and output parameter. Such type can be annotated as func: TypeA -> TypeB. The top level form looks closer to the function notation, but both ways are actually equivalent for the purpose of our discussion. I will use instance methods in my examples, however all of them could be written as top level extension methods too. How do we compose more complex workflows, programs and applications, out of such simple building blocks? A lot of patterns in both OOP and FP worlds revolve around this question. And monads are one of the answers. This code looks quite readable. It’s concise and it flows from top to bottom, from left to right, similar to how we are used to read any text. There is not much noise too. That’s not what real codebases look like though, because there are multiple complications along the happy composition path. Let’s look at some of them. Any class instance in Kotlin can be null. In the example above I might get runtime errors if one of the methods ever returns null back. It’s still the same method, but it got more noise now. Even though I used short-circuit returns and one-liners, it still got harder to read. Now we are almost back to our original workflow code: it’s clean and concise, we just got 3 extra ? symbols around. Quite often a function returns a collection of items, not just a single item. To some extent, that’s a generalization of null case: with T? we might get 0 or 1 results back, while with a collection we can get 0 to any n results. I used List<T> but it could be any class or even a Sequence<T>. It reads ok-ish still. But the combination of nested loops and mutation with some conditionals sprinkled on them can get unreadable pretty soon. The exact workflow might be lost in the mechanics. Now you can see the original original code on the left, combined with just a bit of technical repetitive clutter on the right. Hold on, I’ll show you where I’m going. Let’s discuss another possible complication. This change breaks our nice workflow composition again. You can see that, once again, it’s our nice readable workflow on the left plus some mechanical repeatable junction code on the right. Can you see a pattern yet? In all 3 cases there was a complication which prevented us from sequencing method calls fluently. In all 3 cases we found the gluing code to get back to fluent composition. An instance of type T sits in a generic container. We call addStep with a function, which maps T to U sitting inside yet another container. We get an instance of U but inside two containers. Two containers are automatically unwrapped into a single container to get back to the original shape. Now we are ready to add another step! The name of this pattern is Monad. In Arrow terms, a Monad is an interface with two operations: a constructor just, and flatMap. See that instead of WorkflowThatReturns<A> our containers are called Kind<F, A>, where F is the generic parameter of the container and A the generic parameter of the content. We talk more about them in the glossary. The constructor just is used to put an object into a container Kind<F, A>, and flatMap is used to replace one contained object with another contained object. It’s important that flatMaps’s argument returns Kind<F, B> and not just B, as this new contained object can have different behavior, like a left branch of Either or an async execution of IO. Even though I spent quite some time with examples, I expect you to be slightly confused at this point. That’s ok.
Keep going and let’s have a look at several sample implementations of Monad pattern. My first example was with nullable ?. The full pattern containing either 0 or 1 instance of some type is called Option (it maybe has a value, or maybe not). Option is another approach to dealing with “no value” value, alternative to the concept of null. You can read more about Option to see how Arrow implemented it. When null is not allowed, any API contract gets more explicit: either you return type T and it’s always going to be filled, or you return Option<T>. The client will see that Option type is used, so it will be forced to handle the case of absent value. Sequence is an interface for enumerable containers. You might have used Sequence<T> before, but what you probably didn’t know is that it’s a container type that fills the requirements of a Monad: sequences can be constructed, and they can be flatMapped. The query has no idea about how the collections are stored (encapsulated in containers). We use functions of type A -> Sequence<B> to produce new sequences using the flatMap operation. In the Kotlin coroutines library Deferred<T> type is used to denote asynchronous computation which will eventually return an instance of T. The other names for similar concepts in other languages are Promise and Future. We are back to the familiar structure. Time for some more complications. We’re going to dispel one common misconception. Sometimes the word Monad is used to refer to types like Option, Future, Either… and so on, and that’s not correct. Those are called datatypes or just types. Let’s see the difference! As you have seen, neither Future nor Option implement Monad directly. This is intentional, as you can potentially have several Monad implementations for a single type. For example, RxJava’s Observable can be chained using flatMap, switchMap, and concatMap, and using each is still a Monad. Instead, Arrow specifies that Monad must be implemented by a separate object or class, referred as the “instance of Monad for type F”. What are the benefits of separating the instances from the direct implementation, causing a duplication in methods and an extra layer of indirection? The main use case is allowing you to write code that is generic for any object that can provide a Monad instance object. In this case, like with any other interface, Monad defines the API and behavior but not the implementation details. This pattern is specially useful for libraries that must remain agnostic to implementations, and gives them a lingua franca when building on top of each other. Using the Monad and other similar abstractions, Arrow can provide a rich collection of extension functions and new language extensions that can be reused by other codebases. You can read more about generalizing code in the glossary and typeclasses intro. Quite often though, this might not be the case. A workflow step might need data from two or more previous steps combined. Obviously, this gets ugly very soon. Even though we lost the fluent syntax, at least the block has just one level, which makes it easier to read and navigate. By using coroutines Arrow provides a specialization that enables readable async/await style code for any Monad. This specialization can be accessed using the function binding on any Monad, and the method bind. Internally, Monad#flatMap is used for chaining. These are called Monad Comprehensions, and you can find a complete section of the docs explaining it. There are a couple laws that just constructor and flatMap need to adhere to, so that they produce a Monad with a stable implementation. These laws are encoded in Arrow as tests you can find in the arrow-test module, and are already tested for all instances in the library. A typical monad tutorial will make a lot of emphasis on the laws, but I find them less important to explain to a beginner. Nonetheless, here they are for the sake of completeness. The laws may look complicated, but in fact they are very natural expectations that any developer has when working with monads, so don’t spend too much mental effort on memorizing them. You should not be afraid of the “M-word” just because you are a Kotlin programmer. Kotlin does not have a notion of monads as predefined language constructs, but that doesn’t mean we can’t borrow some ideas from the functional world. Having said that, it’s also true that Kotlin is lacking some powerful ways to combine and generalize monads that are available in functional programming languages.